Tired of turkey? We thought you might be. 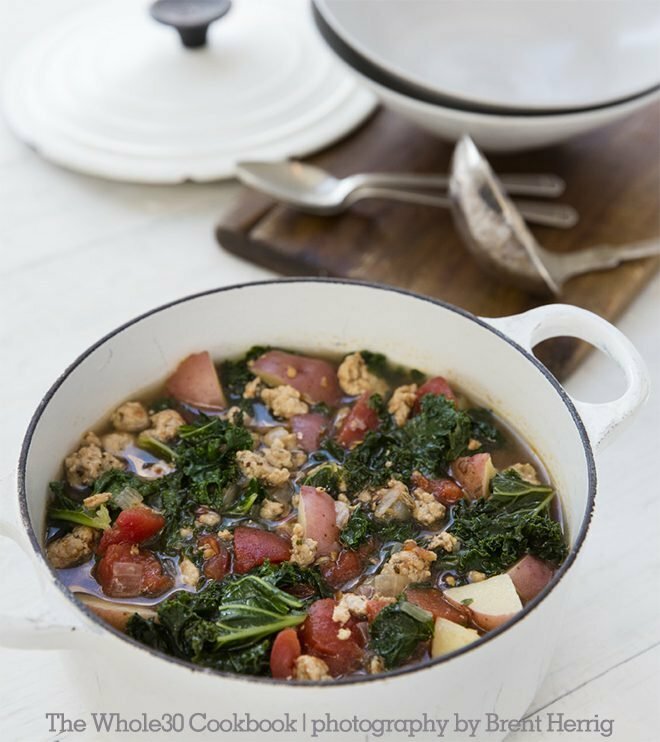 That’s why we picked this recipe for Sausage, Potato and Kale Soup from The Whole30 Cookbook to share with you today. It’s a warm, cozy, and the perfect dish to add to your winter menu rotation. Bonus: this recipe holds exceptionally well, and we think leftovers make for a great lunch or breakfast. 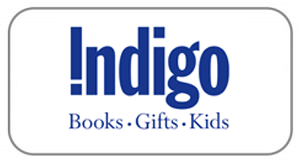 But first, a few details about the December 6th The Whole30 Cookbook release (and Melissa Hartwig’s January 2017 book tour). 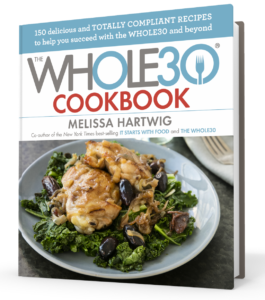 An exclusive recipe preview from @melissahartwig_’s The #Whole30 Cookbook, coming 12/6. 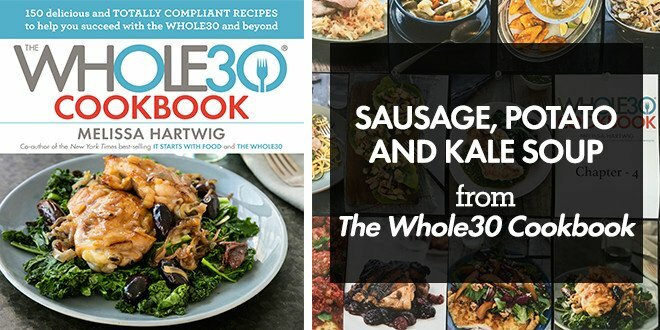 The Whole30 Cookbook hits bookstores everywhere on December 6, but you can get a bonus sneak peek at five recipe from the book today. If you pre-order the book (or RSVP for one of Melissa’s January book tour events), we’ll send you a downloadable recipe sample. 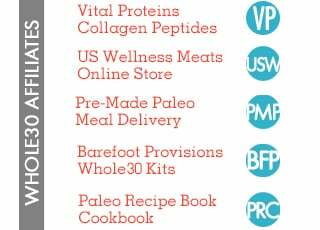 Simply follow the instructions in this blog post and enjoy your The Whole30 Cookbook sneak peek.  Just in time for the #JanuaryWhole30, Melissa will be hitting the road in early 2017 to visit Toronto, Seattle, Kansas City, Denver, and San Fransisco. She’ll talk about the Whole30 program, Food Freedom Forever, and The Whole30 Cookbook. Click here for more details and to RSVP for one of Melissa’s events. HEAT the olive oil in a large pot over medium heat. Add the pork mixture, the onion, and the garlic. Cook, stirring frequently, until the meat is browned. STIR in the broth, tomatoes with their juices, and potatoes. Bring to a boil. Reduce the heat to low, cover, and simmer, stirring occasionally, until the potatoes are just tender, 15 to 20 minutes. Add the kale and thyme and cook, uncovered, until the kale is tender, 5 minutes more. Season with additional salt and black pepper and serve. 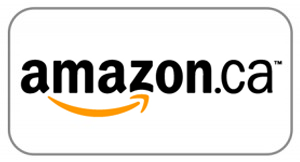 Some links in this post are affiliate links, meaning Whole30 makes a small commission on items purchased via these links. 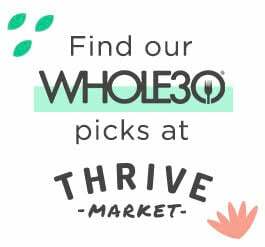 Thank you for supporting our Whole30 Approved partners.